For the album, see Animals (album). Animals are eukaryotic organisms with many cells. They do not use light to get energy as plants do. The study of animals is called zoology. Animals use different ways to get energy from other living things. They usually eat other living things, but some are parasites or have photosynthetic protists as symbionts. Plants are also multicellular eukaryotic organisms, but most animals are mobile, meaning they can move around. Animals take in oxygen, and give out carbon dioxide. This cellular respiration is part of their metabolism (chemical working). In both these ways they are different from plants. Also, the cells of animals have different cell membranes to other eukaryotes like plants and fungi. There are many types of animals. The common animals most people know are only about 3% of the animal kingdom. 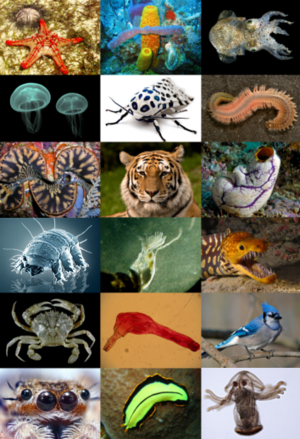 When biologists look at animals, they find things that certain animals have in common. They use this to group the animals in a biological classification. They think several million species exist but they have only identified about one million. Animals can mainly be divided into two main groups: the invertebrates and the vertebrates. Vertebrates have a backbone, or spine; invertebrates do not. In scientific usage, humans are considered animals, in everyday nonscientific usage, humans are often not considered to be animals. The animal mode of nutrition is called heterotrophic because they get their food from other living organisms. Some animals eat only plants; they are called herbivores. Other animals eat only meat and are called carnivores. Animals that eat both plants and meat are called omnivores. The environments animals live in vary greatly. By the process of evolution, animals adapt to the habitats they live in. A fish is adapted to its life in water and a spider is adapted to a life catching and eating insects. A mammal living on the savannahs of East Africa lives quite a different life from a dolphin or porpoise catching fish in the sea. The fossil record of animals goes back about 600 million years to the Ediacaran period, or somewhat earlier. During the whole of this long time, animals have been constantly evolving, so that the animals alive on Earth today are very different from those on the edges of the sea-floor in the Ediacaran. The study of ancient life is called palaeontology. Wikispecies has information on: Animalia. ↑ Maloof, Adam C. et al 2010. "Possible animal-body fossils in pre-Marinoan limestones from South Australia". Nature Geoscience 3 (9): 653–659. doi:10.1038/ngeo934. http://www.nature.com/ngeo/journal/v3/n9/full/ngeo934.html. Pdf. These fossils are interpreted as being early sponges. They were found in 665-million-year-old rock. This page was last changed on 31 March 2019, at 14:51.